Having healthy looking hair is definitely something all girls want. I’ve tried so many products and spent so much money trying to find something to help me out. I learnt a lot about hair care when I studied hairdressing at college and have a few products that I couldn’t live without. It all starts with a good shampoo and conditioner and knowing what kind of hair you have. Do you pick the shampoo for coloured hair? Or damaged? It’s really difficult to know to be honest and I think trial and error is the only way. I have my hair highlighted every several months and alternate a full head, half a head and a T section just to give my hair a break. 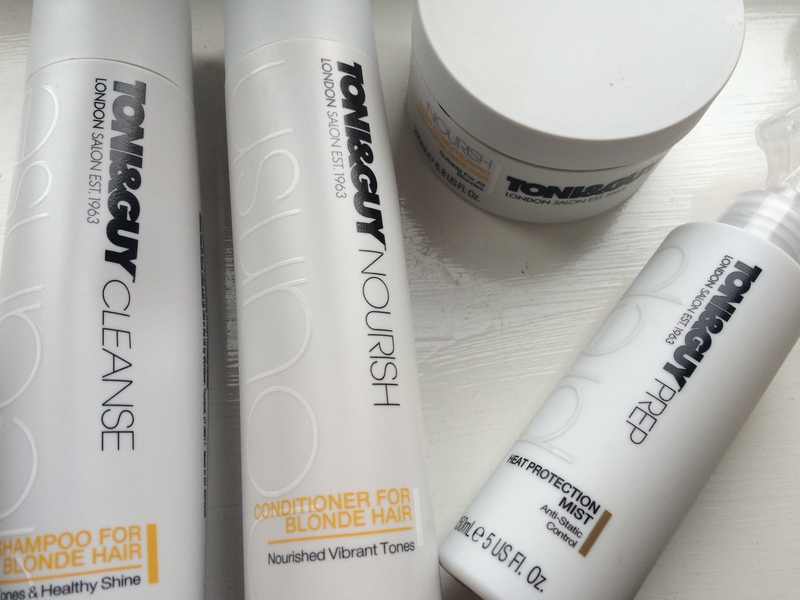 My favouirte shampoo and conditioner is Toni and Guy for blonde hair. They do this for dark hair too and for damaged. I’ve used this for a few years and absolutely love it. I wash my hair 3-4 times a week (depends how lazy I’m being) and think it’s important to try not to wash it everyday! If you can resist. Once a week I use the Toni and Guy condtioning mask for blondes and leave it in my hair for about 10 mins before washing it off. I find this product really nourishing and love how soft and healthy my hair feels after. I then use Morrocon Oil on the ends of my hair and only use a few drops as it’s really rich so you don’t need a lot. This smells amazing and I think is the best serum on the market for your hair. It doesn’t ‘get rid of split ends’ because no product is going to do that other than a hair cut but it’s hydrating and leaves the hair looking and feeling great. I also use a Toni and Guy heat defence spray. I learnt that if you should use any product on your hair it should be a heat defence one. Thats because heat is so damaging to the hair so forming a barrier to protect the hair follicule is vital. I’ve also used Keristase heat defence and anti frizz spray (pink bottle) which I find just as good. I’d recommend this for you over the Toni and Guy if you struggle with frizz.